Jedi and Sith guild leaders alike will meet under BioWare's auspices for some aggressive negotiations. As much as videogames can be fun escapism or immersive storytelling, there's a very serious side to them that few people see. There are a lot of 1s and 0s that go into your favorite character taking a single step onscreen, and there are a lot of accountants crunching dollar signs to ensure that that trilogy you're playing doesn't end after the second game. 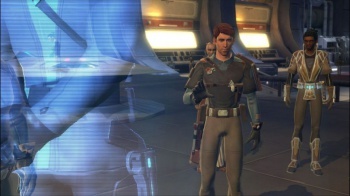 Even in a game like Star Wars: The Old Republic, where space wizards duke it out with laser swords, there can be a peaceful meeting where Jedi and Sith both gather to discuss the game's features. BioWare recently announced the inaugural Star Wars: The Old Republic Guild Summit, which will gather prominent guild leaders from all reaches of its popular MMORPG in Austin, Texas for three days of discussions, QAs, and previews. The negotiations will be short, indeed. BioWare has two main objectives for the summit: get firsthand feedback from some of its most dediated players, and entice said players (and their guilds) with hints of what's to come. "Guild leaders ... will participate in Q&A sessions with developers, roundtable feedback discussions, and will get a preview of some upcoming game features," writes Bioware. All kinds of guilds will be represented, whether they specialize in PVP, roleplaying, or raiding. "The goal of the summit is to facilitate an open discussion between guild leaders and the game design team. If your guild isn't participating but you think it should, BioWare still has space available. Simply fill out an application and await a response. The event will take place at the DoubleTree Hotel in Austin from March 4-6. Anyone 21 or over can apply, but BioWare reminds applicants that they will be required to provide their own travel, lodging, food, and understanding of the English language. On the one hand, BioWare seems to be interested in what its fans have to say. On the other hand, this event is for a very small subset of those fans who have, by and large, different interests and needs from the majority of TOR players. Still, will gathering a handful of people and having a reasonable dialogue in a physical location prove more valuable than thousands of angry forum posts? Difficult to see. Always in motion is the future.